MyEDiary have partnered with Timetabler to provide our users with an easy to use export - import process for data held within their timetable package. Set up period start-finish times to ensure that your class times are brought into MyEDiary. This step only needs to be done once. 1.1 Open your Timetable file. 1.2 Go to step 1C on the Timetable Tasks tree, then click the Start-finish times radio button. 1.3 Enter your period start-finish times. 2.1 To export your MyEDiary data from Timetabler, go to File > Export Data > Admin System. 2.2 In the window that opens, select 'MyEDiary' from the 'Select File Type' drop down. 2.3 Choose where on your computer you'd like the files to be saved. 2.6 In the next prompt for 'Start Date', enter the start date for the date range that these classes span, i.e. the date that Semester 1 begins. Use the format 'dd/mm/yyyy'. Click 'OK'. 2.7 In the next prompt for 'End Date', enter the end date for the date range that these classes span, i.e. the date that Semester 1 finishes. Use the format 'dd/mm/yyyy'. Click 'OK'. 2.8 The files will be saved to the location that you selected. Each of the files exported by Timetabler will be ready for importing into MyEDiary without further manipulation. 3.1 Within MyEDiary, go to Content > Import / Export and choose the relevant tab for the resource that you'd like to import. 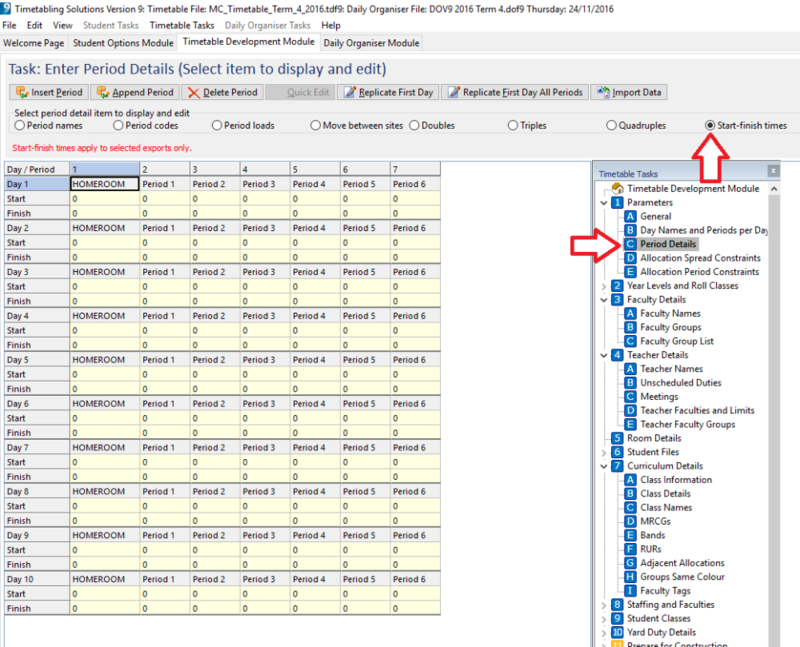 3.2 Select the matching Timetabler export file for that particular resource and simply import. Your import will be queued and processed in the background. Follow the prompts to ensure that the import has run smoothly.